Have you ever seen people creating their portfolios at WordPress? It’s just because WordPress is the best platform to handle your content and visuals with ease. WordPress has got a lot of powerful plugins to showcase your best images. Today, we will see the best Photo Gallery plugins for WordPress. The majority of plugins in this list are Freemium. What does a Freemium plugin mean? These plugins have usually two versions, one is lite and the other is Pro. Trying out the lite version is free. Sometimes, it is more than sufficient considering your requirement. And the pro version is paid. These pro versions have got additional features that you can’t get in the lite version. Okay, let’s get started with the list in no order particular order. Envira Gallery is a drag and drop Photo Gallery plugin. It is one of the most popular Photo Gallery Plugins. Their free WordPress plugin is being used by more than 100,000 active WordPress sites. This simply shows their popularity. These are just a few. They have got many more. FooGallery is another popular Photo Gallery plugin with more than hundred thousand active installations. · Import albums, galleries, and shortcodes from NextGen with NextGen Importer Tool. That’s the next plugin on our list. NextGEN Gallery is another Freemium WordPress Photo Gallery plugin with more than 900,000 active WordPress installations. This plugin offers a complete WordPress Management system. And, it allows you to upload images in batch, import Metadata, sort photos, edit thumbnails and many more. Justified Image Grid (JIG) is a premium WordPress plugin available for $27 at CodeCanyon. An interesting feature of JIG is that they can load your content from Facebook or Flickr and display them as a stunning gallery using jQuery. Also, they have functionalities to remodel your old or existing NextGEN galleries. This is another premium WordPress plugin for Photo Gallery at CodeCanyon for $26. This plugin was built to create galleries by pulling out images from various sources and various post types. By various sources, I mean Facebook, Flickr, Instagram etc. And the various post types include NextGEN galleries, WooCommerce products etc. The name Gmedia stands for Grand Media. The Gmedia photo Gallery plugin is a completely free WordPress plugin and it can handle any file format. Thus, it could easily create galleries, playlists, group pictures and albums in a few clicks. And the plugin’s recent updates include 3D cube Gallery module and displaying Gmedia albums on the Author Profile Page. The Photo Gallery plugin by 10Web is a freemium WordPress Plugin that allows you to organize your galleries and albums in numerous views including Masonary, Blog style, and Mosaic. The plugin has an interesting audio and video support. Because, the plugin could add YouTube, Vimeo, Instagram, Flickr or Dailymotion videos to your galleries. The plugin has got many more interesting features. But, the best features of the plugin are limited only to the pro version. The pricing of the pro version starts at $30. 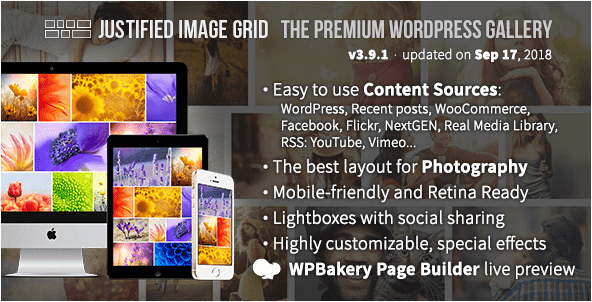 WP Photo Album Plus is a free WordPress plugin. Though it is not a popular WordPress plugin like we came across earlier, this plugin has excellent customer support at WordPress Plugin Forum. This plugin includes 20 widgets, support for Cloudinary cloud storage device and for Fotomoto print service. WP Photo Album plus allows you configure email notification system and you can moderate user uploads and comments. Also, this plugin offers built-in search functions for Keywords and Tags. Sell Media is not specifically a Photo Gallery Plugin. It is an eCommerce plugin to sell your photos and videos. However, it still offers the functionality to create galleries. Not to forget this plugin also allows you to password protect your galleries. If you are interested in making a revenue out of photos in addition to the galleries, then this plugin is a good choice. Sell Media is a freemium WordPress Plugin and the Pro version starts at $12.42/month. 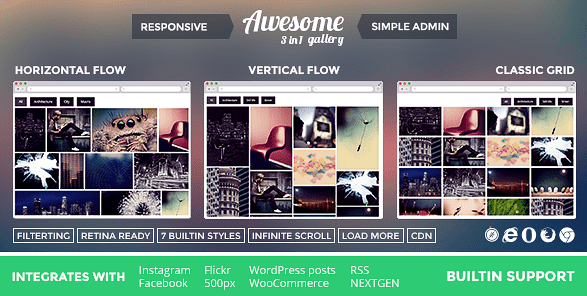 The Gallery plugin by BestWebSoft is a freemium WordPress Photo Gallery plugin. This plugin has got the usual features like the other plugins. And, it allows you to add custom code via the plugin settings page. The Pro version allows you to display like box for the galleries and few more features. The pricing starts at $20 per year. So far, we have seen the popular WordPress Photo Gallery Plugins. But, WordPress repository is always filled with interesting stuff. Here are few more Photo Gallery Plugins that you can try out. To summarize this post, WordPress Photo Gallery Plugins help you to showcase your best images to your audience catching their attention and making it perfect to showcase your portfolio. The advanced features of these plugins include pulling out images from various social media platforms and offering better image management solutions. Have you tried any WordPress Photo Gallery Plugin? Let us know in the comments section. Nirmal Kumar is a Blogger from Chennai, India. He loves to blog on Affiliate Marketing, Search Engine Optimization, Blogging Tips and WordPress. He blogs with passion and started OnlineRockersHub out of zero investment! Very helpful post, thanks for the details. An informative post. To avail free plugins in Wordpress, one has to have a paid Wordpress account, is it not? Because no plugin is allowed with free Wordpress.